The Baby Trend Manta Snap Gear™ Jogger has it all with a multitude of seat configurations, you are guaranteed to find a relaxed and perfect fit for your bundle of joy. Compatible with Baby Trend Snap Gear ™ Infant Car Seats, simply snap and stroll. The adaptability features allow extreme versatility so this seat can be in forward facing, parent facing, or horizontally balanced position as a bassinet. The durable steel structure frame supports the performance of this jogger to surpass average quality standards. 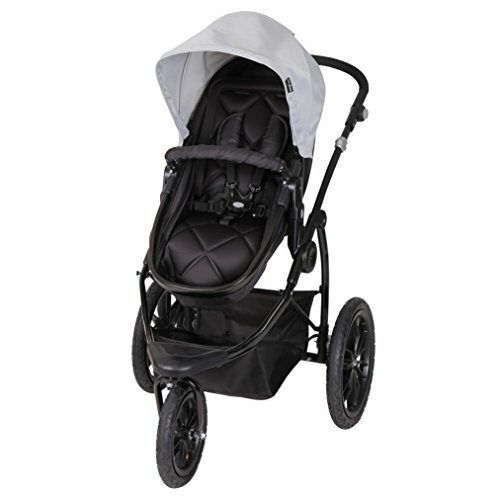 The dual locking foot brakes, and lockable front composite swivel wheel makes this jogger extremely easy to maneuver. Your little one will ride safe and happy with this five-point safety harness, harness covers, tether strap, and adjustable canopy to block the sun and wind. The large storage under basket, effortless trigger fold, and adjustable handle round out the amazing features of this incredible buy. The Baby Trend Manta Snap Gear™ Jogger is part of the Snap Gear™ Modular Program, an interchangeable family of products designed by Baby Trend to provide multi-function and ease of use. The Modular Program allows parents to simply snap for security and go.